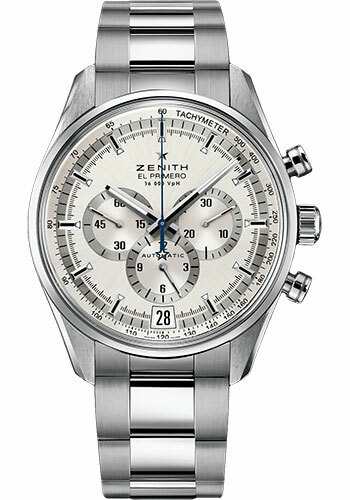 42mm stainless steel case, transparent sapphire glass back, silver sunray dial with nickel circular satined zones, automatic El Primero 400 B movement with hours and minutes, small second, date, chronograph, approximately 50 hours of power reserve, stainless steel bracelet. Water resistant to 10 ATM. 42mm stainless steel case, transparent sapphire glass back, black sunray dial with nickel circular satined zones, automatic El Primero 400 B movement with hours and minutes, small second, date, chronograph, approximately 50 hours of power reserve, black alligator leather strap with steel pin buckle. Water resistant to 10 ATM. 42mm stainless steel case, transparent sapphire glass back, black sunray dial with nickel circular satined zones, automatic El Primero 400 B movement with hours and minutes, small second, date, chronograph, approximately 50 hours of power reserve, stainless steel bracelet. Water resistant to 10 ATM. 42mm stainless steel case, transparent sapphire glass back, black sunray dial with red accents, automatic El Primero 400 B movement with hours and minutes, small second, date, chronograph, approximately 50 hours of power reserve, red stitched black alligator leather strap with steel pin buckle. Water resistant to 10 ATM. 42mm stainless steel case, transparent sapphire glass back, blue sunray dial with nickel circular satined zones, automatic El Primero 400 B movement with hours and minutes, small second, date, chronograph, approximately 50 hours of power reserve, black alligator leather strap with steel pin buckle. Water resistant to 10 ATM.